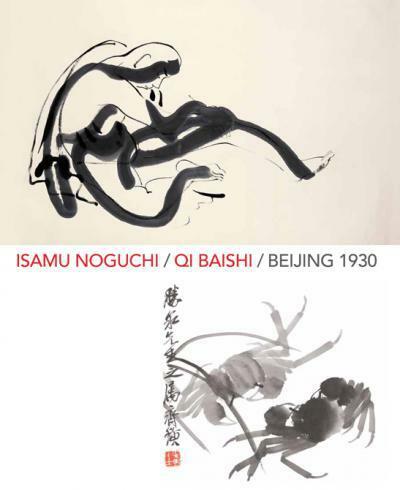 Isamu Noguchi and Qi Baishi: Beijing 1930 is a major exhibition exploring the relationship between the two artists established in 1930 when, at the age of twenty six, Isamu Noguchi (1904–1988) stopped in Beijing en route to Japan. Sotokichi Katsuizumi(1889-1985), a Japanese businessman and collector of Chinese painting, introduced young Noguchi to Qi Baishi (1864–1957), who is considered one of the most influential ink painters in China in the 20th century. For six months, Noguchi worked with the eminent artist in his studio, developing a new vision of abstraction. Organized by the University of Michigan Museum of Art in a collaboration between The Noguchi Museum, Isamu Noguchi and Qi Baish: Beijing 1930 explores this pivotal but lesser-documented moment of Noguchi’s career, which resulted in some 100 ink scroll paintings. This exhibition marks the first pairing of Noguchi’s scrolls with those by Qi Baishi, which have been selected from the same period, alongside the seal that Qi made for his young pupil. Prior to meeting Qi Baishi, Noguchi’s sculptural work effectively jumped between figuration and abstraction. This exhibition suggests the lasting significance of his study of traditional ink brush technique with Qi Baishi was less a point of departure than a stimulus for his reconciliation of the two in his later outlook on sculpture. In addition to examining the influences the elder artist’s practice had on Noguchi, Isamu Noguchi and Qi Baishi also illuminates their respective and lasting effects on contemporary art internationally. Opened The Noguchi Museum, in New York City, on September 25, 2013 and it will be on view through January 26, 2014. The works are on loan from the UMMA’s collection (including works given by Katsuizumi to the University, his alma mater); The Noguchi Museum (Noguchi also acquired works by Qi); and other public and private collections. Before its current presentation—its only East Coast venue—the exhibition was on view at the UMMA. The tour concludes at the Frye Art Museum in Seattle (February 22–May 25, 2014). While the experience of studying with Qi Baishi transformed aspects of Noguchi’s practice, it also had an impact on the senior artist. During his stay, Noguchi created a series of more than one hundred ink-and-brush works later called the Peking Scroll Drawings. These occupy an important place in his development as an artist and realization of his own form of abstraction. With a selection of Noguchi’s Peking Scroll Drawings, Qi Baishi’s paintings, and archival materials, the exhibition also provides insight into the importance of China in Noguchi’s artistic formation. A master seal-maker, Qi created and presented Noguchi with his own seal. This was a highly symbolic gesture because seals serve not just as signifiers of the creator; along with handwritten signatures and inscriptions, they are part of the artist’s persona and integral elements of a painting. The seal, included in the exhibition, demonstrates the master held his student in high esteem. Courtesy of The Noguchi Museum, for further information please visit www.noguchi.org.